When visiting Southern Utah, most travelers have a visit to Zion National Park at the top of their itinerary. Utah’s first national park, Zion extends across more than 200 square miles encompassing fascinating natural features. Travelers come to the park to marvel at towering red rock spires and the 15 mile-long canyon. If you’re planning a trip to the area, be sure to check out the tours lead by Zion Outback Safaris. Offering unique expeditions, this company will take you on a safari through the park, private Jeep tours, or even helicopter rides over the area. 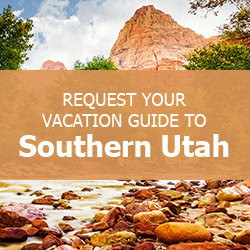 Let us help you cut your planning time in half by downloading our complimentary Southern Utah Vacation Guide! This handy travel tool is packed with dozens of recommendations on the best activities, restaurants, and other attractions like tours with Zion Outback Safaris. So many families have used this guide to help them have an unforgettable trip. Get your copy today! Zion Outback Safaris’ most popular expedition, the Mesa Vista Safari tour begins in Springdale, UT, and lasts for three hours. The entire family can hop into one of the company’s 4×4 safari vehicles and climb to the top of Zion Park’s Kolob Terrace. Along the way, the tour guide will stop at astonishing outlooks and ideal photography spots. Guests will witness either the Smith Mesa or Hurricane Mesa, both of which provide magnificent views. Click here to learn more about this outstanding excursion. Also lasting about three hours, the Private Jeep Tours can accommodate up to seven people. This adventure is perfect for a family that wants to customize their experience. You have the option to explore the area’s Outback, Mesa Vista part of the national park, or other back roads in the surrounding region. These well-equipped vehicles can power over uneven terrain and up steep ascents on Zion Jeep trails. If you plan to visit other national parks as well, you should learn more about Bryce Canyon Jeep Tours! If you’re willing to splurge on a thrilling excursion, the Zion 360 Tours are well worth the expensive price. On this tour, Zion Outback Safaris combine a half-day of off-roading with a helicopter flight over the landscape. In just one day, you and your family can experience the rush of riding through Zion National Park in a rugged, customized Jeep. During this portion of the adventure, you’ll get an up-close look at natural wonders and attractions found in the park. Then, take to the sky to witness aerial views of unexplored wilderness and massive land formations. Find the Perfect Rental with Family Time Vacation Rentals! When visiting Southern Utah, you and your family will need a comfortable place to stay. Family Time Vacation Rentals offers properties of all sizes in four towns throughout Southern Utah. Each location is within an hour and a half of Zion Outback Safaris, and we have several properties near national parks. This Private Deluxe Retreat is perfect for multiple families traveling together. With five bedrooms and additional sleeping space, this large home can accommodate up to 12 people. Enjoy proximity to Zion National Park and Bryce Canyon and stunning mountain views from the expansive back deck. In the summer, make use of the outdoor grill, and take advantage of the basement movie theater year-round! The Anasazi State Park Museum is One of the Best Historical Sites — Where Are the Best Southern Utah Canyons?